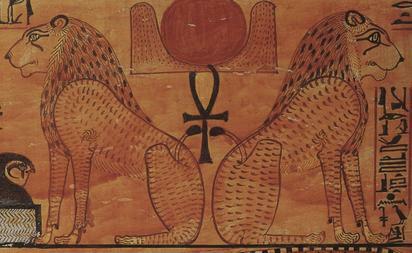 The ancient Egyptian “Aker Lions” motif is a mystery to Egyptologists. 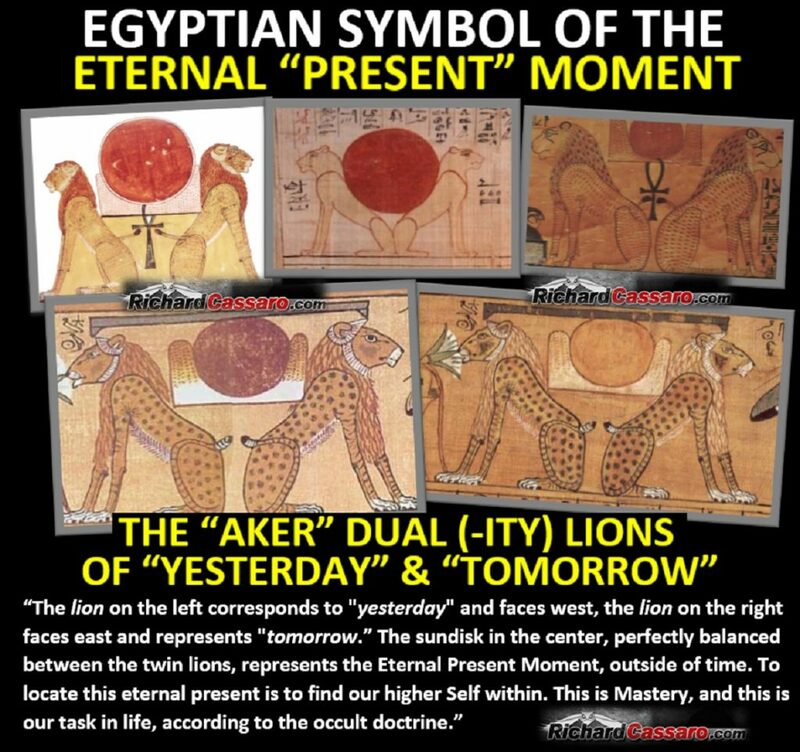 It depicts two lions, named “Yesterday” & “Tomorrow,” who are shown back-to-back facing opposite directions and flanking the Egyptian sundisk or “Aten” symbol, which is emblematic of the “source” or “higher Self.” We´ll see how this Aker Lions hieroglyph signifies the “Eternal Now” moment. When we focus on the Now moment, something magical happens. This wisdom later became a major underpinning of hermetic teachings and occult philosophy. One of the most mysterious and popular symbols of Egyptian papyri is the so-called Aker Lions hieroglyph. Egyptologists tell us that the lion on the left corresponds to “yesterday” and faces west, the lion on the right faces east and represents “tomorrow. But their interpretation ends there. No metaphysical, spiritual or occult wisdom for this symbol is provided. Depiction of Aker Lions hieroglyph from ancient Egyptian papyrus. According to de Lubicz, the sundisk in the center, perfectly balanced between the twin lions, represents the“Eternal Present Moment,” outside of time. In this interpretation, the sundisk itself symbolizes the soul balanced between Yesterday and Tomorrow, and so centered. In other words, to locate this eternal present is to find our “soul within” or “higher Self” within. This is Mastery, and this is our task in life, according to the occult doctrine. The idea of an “eternal present” moment or the “eternal now” moment is a major concept in Eastern spiritual teachings and occult philosophy. This is the ancient spiritual teaching of nonduality, the common ground of Advaita Vedanta, Ch’an Buddhism, Zen, Taoism and Sufism, the same common ground which is at the core of virtually all ancient religions, spiritual systems and philosophical movements. The idea of the “eternal now” moment teaches, basically, that there is no power greater than the present. We should not look to the past or the future, because they simply do not exist. Focus on the now. This is all we have, and this is all we will ever have. The now moment is eternal, and the now moment is reality in a world of illusion, which is the world we presently live in. The Egyptians not only understood this age-old wisdom of non-duality (a relic of Eastern tradition), but they used the Aker Lions motif as a kind of special symbol or designated hieroglyph to exemplify one aspect of its wisdom—the eternal now moment. 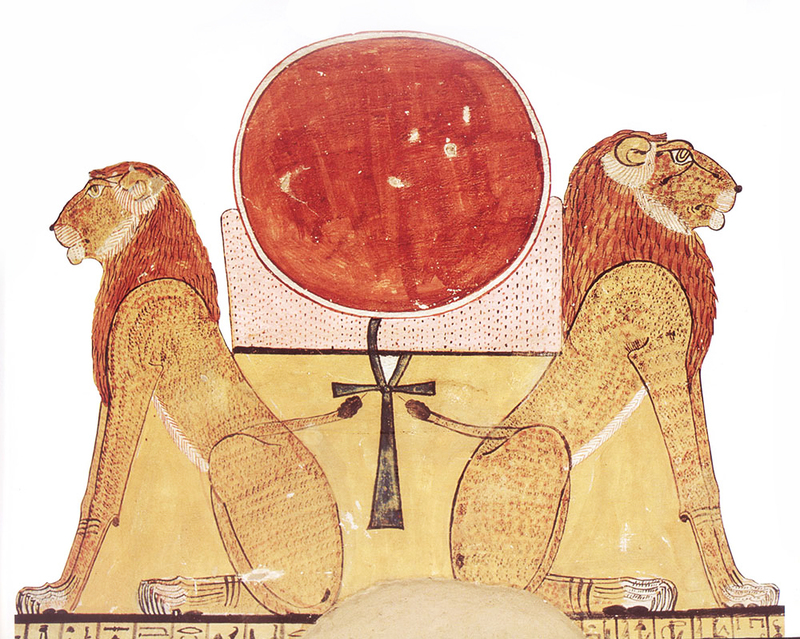 The Aker lions motif appears abundantly in Egyptian papyri, always in the same pose flanking the luminous Aten symbol, drawing our attention to the Aten. 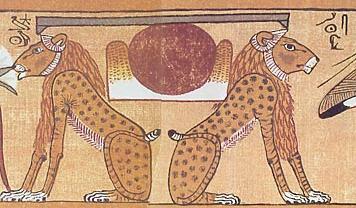 The Aker Lions can even be considered a “clue” as to the deeper meaning of the Egyptian sundisk or Aten symbol.